It's our last day of July My Creative Time sneak peeks, and we have another darling set to share with you today: Hey There Little Lady. This set is full of sweet little flower, heart, and ladybug stamps and dies, with lots of fun sentiments in the cutest font! For my card, I wanted a flowerpot, so I made one by modifiying the tag die from Stitched Round Tab, Arrow & Tag Dies, plus one of the Stitched Decorative Banner Dies. I added a little flower button made with the Stitched Button Dies, which I tied on with a bit of twine. Inside the pot, I put some black-eyed Susans from Hey There Little Lady with a cute little ladybug perched on top. I colored everything with my Zig Clean Color Real Brush Pens. "Thank You" is one of the sweet sentiments from this set! OMG Miss Katie OMG What an awesome card. You totally came up with an outstanding creative idea with your flower pot. When I saw it I said to myself "How'd she do that" and now I know girl another on of your genius ideas using Miss Emma's goodies so can't wait to do this. Love your pot of flowers with the adorable ladybug. YOU so ROCK!! Love the flower pot, flowers and the ladybug on the card! So Cute! This is just adorable! I can't wait to see this whole set!! I love how you made your own flower pot, and stuck it on the card! Genius idea!!! from my 9 year old daughter, Clara. What a cute card! Great design work....thanks for sharing with all of us...I cannot wait to get this set. Great card. That little flower pot is too cute! Lovely card Katie! The flower pot was a nice touch! Cute idea. love the flower pot and your coloring. Very sweet card, love how you colored the ladybug and the flowers. Great job showcasing the new release. Looking forward to the blog hop tomorrow! My Black Eyed Susans are almost ready to bloom and so glad you colored them that way. Very clever how you made your pot for the flowers. I really like the button and twine. How cute are these ladybugs? Beautiful job on your card. Lovely card Katie! Love everything about it! TFS! Love your card! Thanks for sharing how you did your little pot. Great Job!! Black eyed susans!!! my favorite wild fllower!!! I like how you thought of a flower pot!!! Awesome card!!! Love the colours in this card and the co-ordination with the background. Your watercolour background for the flower pot is great! Love the shading and blending of the colours on the flowers and your ladybug. Great card! You did a terrific job! the flower pop looks so nice. Love how the flowers are popped off the card. Love your pot of Black Eye Susan! 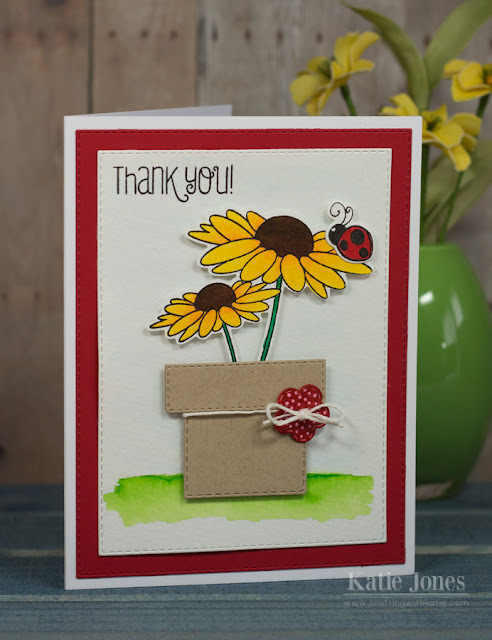 Beautiful and vibrant card, I like the way you added the button flower to the pot. Brown Eye Susans and lady bugs, perfect. How cute. I like the pot you created. Wow, that is so pretty. Loving this new set. What a nice card, and what a great idea for the flower pot too. I just love those lady bugs. So far I love everything about this set. Love your creativity in creating the flower pot. this is the coolest set yet!! I love it when they match the dies also to them! Katie ~ Oh my word! HOW BEAUTIFUL and CLEVER is this! I LOVE your coloring and that flower pot ~ BRILLIANT idea!!! You really have mastered those pens ~ so not kidding!